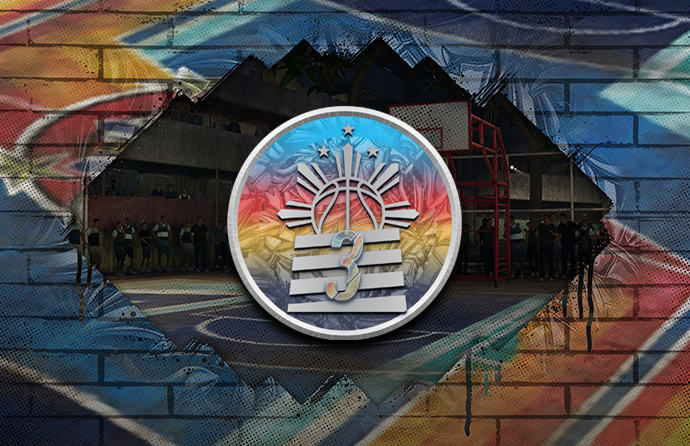 We are going back outside for some more 3v3 streetball, but this time for a very special court in Taguig, Philippines! Recruit some of the most charitable players and play on The Tenement which was created by the community for the community! There are two types of rewards: Graffiti Style Points and Graffiti Master Tokens. Graffiti Style Points are your campaign currency that you earn to progress and earn 3v3 Masters. 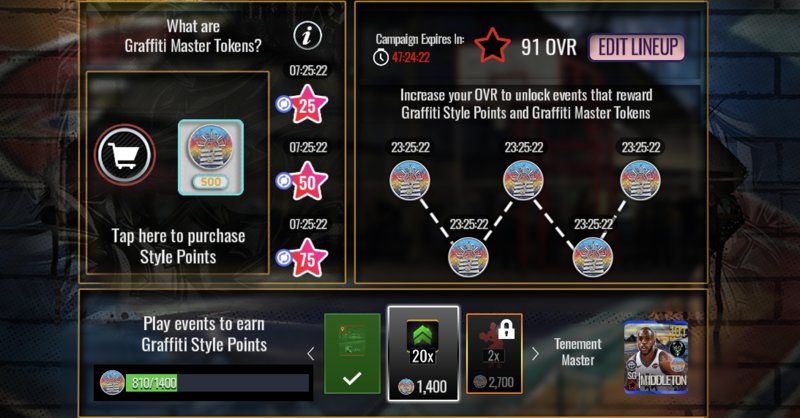 Graffiti Master Tokens are a collectible you earn from the progression events towards the Graffiti Master. 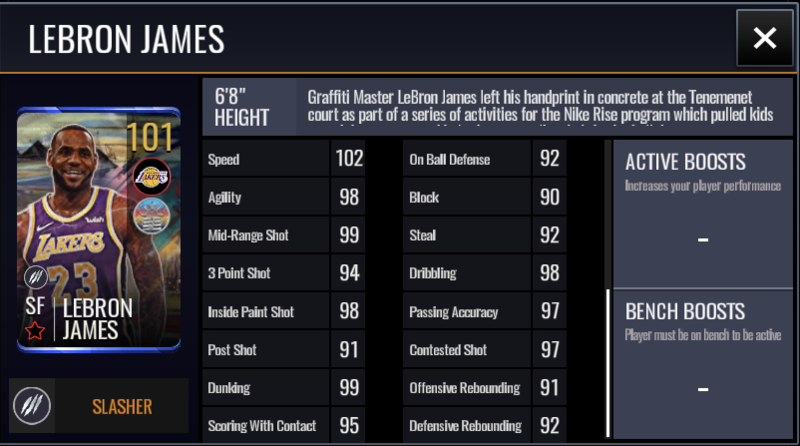 You need 20 Graffiti Master Tokens (plus 50 Elite players) to earn 101 OVR Platinum Lebron James. Earn Graffiti Style Points from Live Events in order to recruit various players in each position by passing the below milestones. These players will help you earn more Graffiti Style Points. 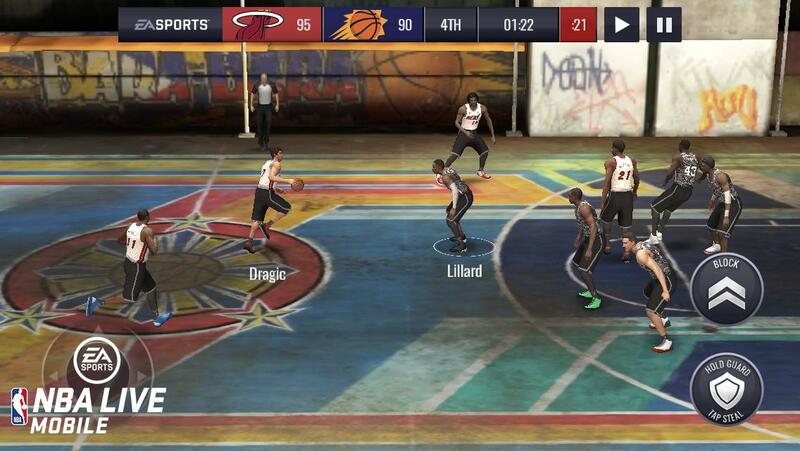 Once you reach Milestone #1, you earn the Tenement Basketball Court with 20% Graffiti Style boost. Once you reach Milestone #9, you earn one of the two Masters (you can pick). Once you reach Milestone #14, you earn the second Master. Once you reach Milestone #16, you earn the Tenement Basketball Court with skill boost. Once you reach Milestone #20, you earn an ability token to add an ability to either Master. As you increase your lineup OVR, you will unlock new 3v3 matches on the progression side of the map to earn Graffiti Style Points and Graffiti Master Tokens. For each event, you can earn 500 Graffiti Style Points and 1 Graffiti Master Token every 24 hours on first win only. There are 3 blitz events that reset every 8 hours (meaning you can earn the first time win bonus every 8 hours). To accelerate progress, you can purchase Graffiti Style Points in the Store. There are three Masters you can earn in the 3v3 Tenement campaign. Horford and Middleton are the 3v3 Tenement Masters and James is a special Graffiti Master you earn through Graffiti Master Tokens and Elite Players. 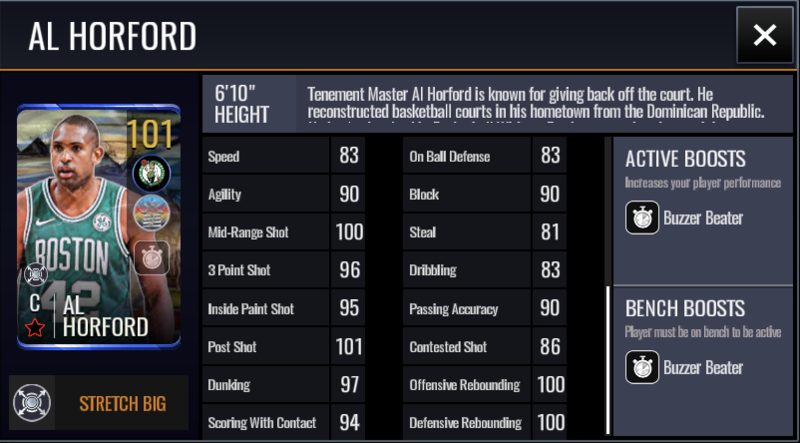 Tenement Master Al Horford is known for giving back off the court. He reconstructed basketball courts in his hometown from the Dominican Republic. He is also involved in Basketball Without Borders, engaging the youth in developing countries. 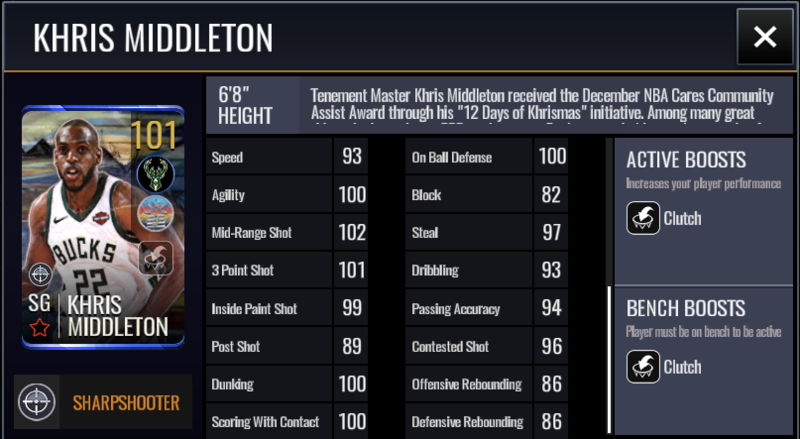 Tenement Master Khris Middleton received the December NBA Cares Community Assist Award through his "12 Days of Khrismas" initiative. Among many great things, he hosted over 200 students at a Bucks game, held a movie screening for local kids in foster care and gave gift bags to teachers at Hawthorne Elementary School. Graffiti Master LeBron James left his handprint in concrete at the Tenement court as part of a series of activities for the Nike Rise program which pulled kids to trainings camps and help them to realize their basketball dreams. 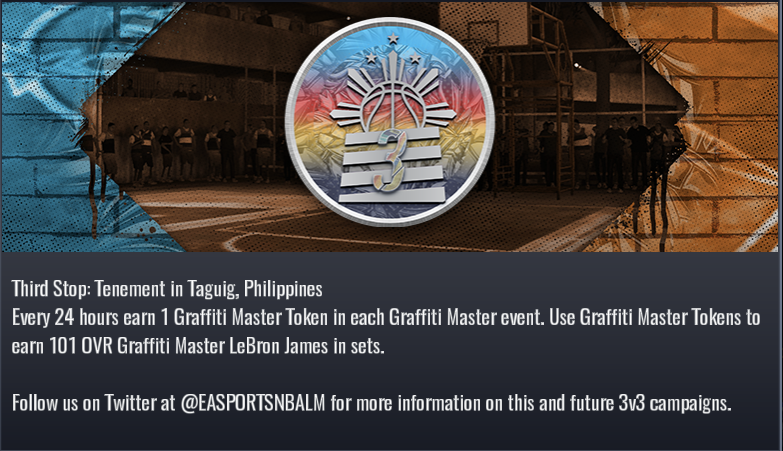 You need 20 Graffiti Master Tokens and 50 Elite Players to earn Graffiti Master Lebron James. You can use old elite players on the Graffiti Master. so far this looks copy paste from quai54.. If im not wrong if you have 86ovr street lineup u can get 5 graffiti master tokens per day so in 4 days we can get the 20 tokens that are needed for Lebron. Am i missing something else? And @SAVAGE21_NBA u get them by doing the live events inthe map, u get 1 token per win and the events refresh every 24h. Yes! Street players! I just need one more to get the full +8 boost from GWiz and I'll be a happy man. I'd love to get the court too but as a f2p player I don't see that happening. What a surprise we need 50 elites right after they come out with the elite exchange sets hahaha. Thank goodness I didn't turn in any elites. You need 50 Elite Players to get Lebron, Is he worth it? By checking the stats and him Without ability, Still worth it? Without ability, I think it is not worth it! Middleton looks good. With clutch he would be really good. But we are about to start NBA Masters and Allstar. And tomorrow should be B Side player. Lots going on! I will make some profit with him. Anyone had a problem with the 2700 graffiti points pack? Heard there was some problem and the wrong players came out. I'd still go for it because I have too many elite cards between 81 to 89. Yes, his flashback card stats was very bad. I never started him...he was on the bench to boost starter Divac's stats on post. He's no longer on bench now tho since I got Walton 96 for 150k coins to replace Divac himself.